In my work as a therapist at a college counseling center, for a number of years, it was so easy to get caught up sitting in my office all day. While I knew it would be enormously helpful to get out and take a walk, I didn’t know how to incorporate it, nonetheless justify its benefit. Then, one day an idea struck. As part of my job training beginning clinicians, I decided to try “walking supervision.” I honestly imagined that it would only be a one or two-time thing, but it was so rejuvenating and creative that it was hard not to stop! Like a kid being told that it was time for recess, I’d always look forward to that supervision hour. My supervisees and I would stroll the college campus, meandering past beautiful trees in autumn and overlooking views of the snow covered mountains in winter, and we’d talk about everything. We’d talk about cases and brainstorm new angles on how to understand our patients’ suffering and how to chart new journeys towards hope. We’d explore what it felt like to be juggling the complex and intimate territory of being a counselor, sharing the personal reactions that enlarged our understanding of ourselves as therapists as it expanded our empathy for those we were helping. Instead of needing to be so formal in the office, staring directly at each other as we went through a list of issues to cross off, we became free to let our thoughts and reactions take us wherever they needed to go. Supervisees, who typically felt inhibited and shy about being evaluted and doing ‘the right thing’ began to talk more candidly. The walking itself opened up new paths! As we strolled one day, I was reminded that the goal of therapy, as Freud had laid out from the start, is to help people “free associate,” in other words to help them flow, become more creative, and open up to the many interesting and complex possibilities that life has to offer. The therapist, not only models this process through ‘evenly hovering attention’—the Zenlike capacity to be receptive to a variety of intriguing thoughts and feelings—but also participates in it through the playful pursuit of new ideas, feelings, and meanings. Taken together, this process becomes a dynamic and delightful interplay of new possibilities that transform each of the players in a game, which then just spurs on a new round of more interesting adventures. To paraphrase child psychoanalyst Donald Winnicott, the goal of therapy is to play, and where the child has forgotten, it is to remind them again! This is what happened as we walked-we began to remember how to play again, and in so doing, we rediscovered our creativity together. Colleagues impishly mocked us as they passed us by. I can’t tell you how many times they thought we were just stealing a break together. Imagining we were shirking our duties, in actuality, we were expanding our capacity to think & feel big! Casting a wider net into our imaginations, we were discovering possibilities that would have easily eluded us while sitting still. Psychologist Rollo May, in his book “The Courage to Create” encourages people to alternate hard work with times of relaxation so that the unconscious can allow pieces come together in novel and unexpected ways. As writer Brenda Ueland puts it: “the imagination needs moodling–long inefficient happy idling, dawdling, and puttering.” This is, after all, how many of the scientific, mathematical, and artistic breakthroughs came to their originators, so why shouldn’t we all try to walk our way towards it too? Walking, it turns out, loosens up not just our bodies, but it also stretches and opens our minds! Recent neuropsychological research supports the notion that we are most creative when we are connected to our body and mind, and more specifically when we integrate our left and right brain systems. The dominant and newer left-brain houses the analytical and linear system of language and explicit memory while the rights brain houses the dream-like, freewheeling, emotional, implicit side. Psychologically speaking, to truly get the full picture, to see with depth and dimension, we need to exercise each. Walking and freely talking, it turns out, does this elegantly, by linking us up to the best of both worlds! There is also hard evidence to support what many artists and scientists have known throughout the ages: walking is a trusted source for creative possibility. Oppezzo and Schwartz found that creativity increases substantially when we walk, noting that 60 percent of subjects tested were able to generate 60 percent more uses for an object. Furthermore, walking produced these results not only during the walk itself but when people sat down following it. In fact, they generated significantly more and subjectively better ideas than in their pre-exercise testing period. If you’re e a skeptic, you may think that it’s not the walking itself, but the fact that you are surrounded by a beautiful landscape that makes the true difference. It turns out subjects who were tested outside in nature and on a treadmill facing a blank wall were comparably more creative than those who didn’t walk. So there’s something about the magic of walking itself that can transform each of us. I’ve continued my pilot of walking supervision, and I’m delighted to say that it’s made myself and my supervisees happier, healthier, more creative, and more empathic. We talk a lot in psychology about the importance of proper self-care and about making time for it amidst the stress of our highly taxing jobs. Couldn’t we all use this? 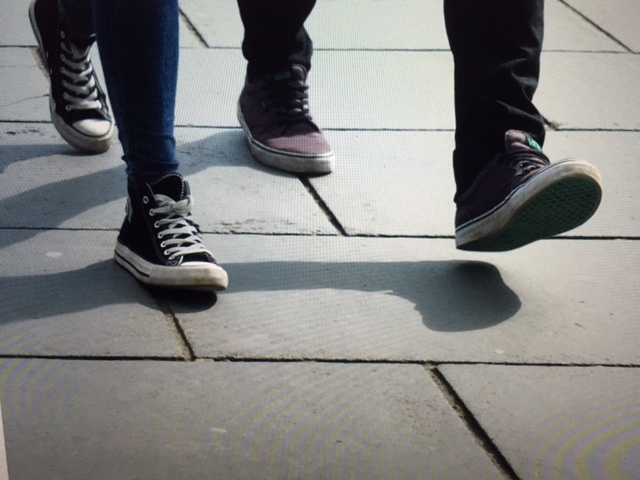 What better way could there be than incorporating walking meetings into your daily routine? Not only will you feel better and more energized, the Muse will reward you with new ways of seeing and imagining what’s been sitting right in front of you! Michael Alcee, PhD. is a clinical psychologist who works at the counseling center at the Manhattan School of Music and in private practice in Tarrytown, NY. If you’d like to learn more about his work, check out his website at drmichaelalcee.com or on his profile on LinkedIn. May, Rollo (1994). The Courage to Create. New York, NY: Norton & Company. Oppezzo, M., & Schwartz, D. L. (2014). Give your ideas some legs: The positive effect of walking on creative thinking. Journal of Experimental Psychology: Learning, Memory, and Cognition,40(4), 1142-1152. doi:10.1037/a0036577. Reynolds, Gretchen (2014, April 30). Want to Be More Creative? Talk a Walk. The New York Times, retrieved from nytimes.com. Schore, Allan (2012). The Science of the Art of Psychotherapy. New York, NY; WW Norton and Company. Ueland, Brenda (1987) If You Want to Write: A Book About Art, Independence, & Spirit. St. Paul, Minnesota: Graywolf Press.